Fu Xinxi, a folk artist in Liaocheng, Shandong province, shows his "lover dough figurines" on Feb 9, 2014. 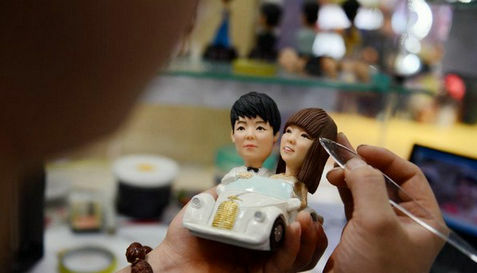 Fu's dough figurines are popular among couples for Valentine's Day. They are made from steamed wheat flour, glutinous rice flour and glycerin, and are created based on pictures provided by the couples.